It doesn’t take an expensive salon visit to revitalize color-treated hair. For vibrant and long lasting color without the cost, use TRESemmé Color Revitalize Shampoo to restore your radiant color. When you finally find the perfect shade, there’s nothing worse than watching it fade. But listen, those dull days are over. Our TRESemmé Color Revitalize system with Advanced Color Lock Technology helps keep color vibrant for up to 8 weeks*. Enriched with nourishing green tea, rosemary and sunflower, our Color Revitalize moisturizing shampoo with Advanced Color Lock Technology gently cleanses and conditions to help replenish vital moisture and restore your vibrant color for up to 40 washes*, all while keeping every strand soft and manageable. That means you’ll get the best salon quality color shampoo without the cost of a salon visit. *TRESemmé Color Revitalize Shampoo and Conditioner vs. non-conditioning shampoo. Step 1:Coat hair with a liberal amount of TRESemmé Color Revitalize Shampoo. Step 2:Gently massage the scalp and roots with fingertips to work into a lather. Step 3:Lightly squeeze the shampoo from roots to ends and rinse thoroughly. Step 4:Finish with TRESemmé Color Revitalize Conditioner and style with your favorite TRESemmé styling aids as needed. TRESemmé Color Revitalize Shampoo, a shampoo for color treated hair, protects and replenishes moisture and helps your vibrant shade last. 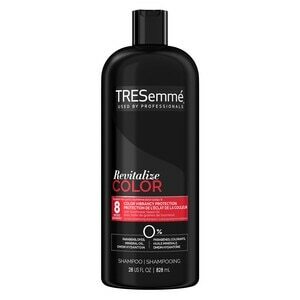 TRESemmé Shampoo, Color Revitalize 28 oz Water (Aqua), Sodium Laureth Sulfate, Cocamidopropyl Betaine, Sodium Chloride, Dimethiconol, Fragrance (Parfum), Glycerin, Carbomer, Styrene/Acrylates Copolymer, Guar Hydroxypropyltrimonium Chloride, Tea-Dodecylbenzenesulfonate, Citric Acid, Glycol Distearate, Helianthus Annuus (Sunflower) Seed Oil, Camellia Sinensis Leaf Extract, Ascorbic Acid, Tocopheryl Acetate, Panthenol, Rosmarinus Officinalis (Rosemary) Leaf Extract, Niacinamide, Biotin, Tetrasodium EDTA, DMDM Hydantoin, Peg-45M, PPG-9, Imidazolidinyl Urea, Polysorbate 20, Methylchloroisothiazolinone, Methylisothiazolinone, Cocamide Mea, Mica (Ci 77019), Titanium Dioxide (Ci 77891). Our Experts' Tips - Coat Hair With A Liberal Amount Of Shampoo. Gently Massage The Scalp And Roots Wit Fingertips To Work Into A Lather. Lightly Squeeze The Shampoo From Roots To Ends And Rinse Thoroughly. Finish With Tresemme Color Revitalize Conditioner And Style With Your Favorite Tresemme Styling Aids As Needed. Our Stylist Suggest: Step 1. Coat wet hair with a liberal amount of shampoo. Step 2. Gently massage the scalp and roots with fingertips to work into a lather. Step 3. Lightly squeeze the shampoo from roots to ends and rinse thoroughly. Step 4. Finish with TRESemme Color Revitalize Conditioner and style with your favorite TRESemme styling aids as needed. For more salon secrets from our stylists go to tresemme.com.